Greetings from the frozen tundra, errrr I mean the SW Chicago Burbs where at 5AM it was 20 below! A good reason to stay inside and stamp today! Today's Bloggers Challenge is The Same But Different. I've chosen to use the same layout (this weeks CPS Sketch 99) and different card stock and images. I've also combined it with a sneak peek at some new product from JustRite that will be showcased at CHA. JustRite will be introducing lower case font sets to use along with their upper case font sets - how cool is that! 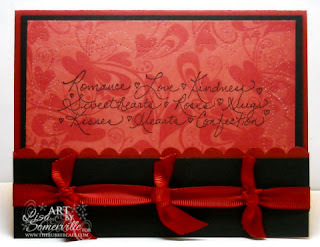 These new fonts will coordinate with the existing JustRite products and work great with JustRite's Rectangle Stampers to great your custom words and sentiments! For my first card, I stamped my trees from Lovely as a Tree in Artichoke and covered them in Flower Soft. I used my Sizzix Button Die to create the buttons, tying on some hemp, and my Ellison Weave #1 Texture Plate to add the embossing to my Artichoke Panel - to give my embossing some dimension I used the CuttleBug Highlights Technique - using Artichoke Ink. TIP - if you are having trouble getting deep impressions with your Texture Plates, lightly mist your card stock before running it through your machine, or add an extra shim such as the plastic piece that comes with your crease pad, or an extra piece of card stock. To create my sentiment, I used the JustRite Special Occasions 50 Point Font for my "S" and "W" and the new Times Roman 25 Point Lower Case Font being introduced at CHA for my other letters. On this next card using the same sketch, I stamped my Love Words in Black on my Cosmo Cricket Chemistry Paper. Instead of using buttons as in the original sketch, I tied on my red ribbon and some faux bows. I also used the Ornare Corner Template to add some paper piercing to my paper. Thanks for stopping by - hope you all have a wonderful WARM weekend! Both of these are gorgeous! LOVE the trees with the FLower Soft and that Cosmo Cricket paper is soooo YUMMY! TFS! Such lovely projects Lisa. I received a sample in the mail of the flower soft stuff...very interest effect and feel. I love the application you have used here. As always, your projects are stunning. Both cards are gorgeous! Love the look that the flower soft achieves! and that layout looks so different with the different colors! Great job! Gorgeous! I love what you did on the trees! Stay warm! Great cards. The Sympathy card is really stunning. That (Flower Soft) really added to the card. Love the rounded corners. What a bold color combo on card #2 - that DP is gorgeous. Love the flower soft and the weave background is super cool looking! 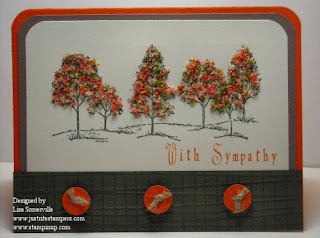 Lisa, what a gorgeous sympathy card! I love the look of the flower soft use. I haven't tried it yet, but will be ordering soon. Just beautiful! These are stunning Lisa! Great job with the challenge this week. That Flower Soft looks SO pretty! Those trees are utterly gorgeous on your CPS card...I love them! Great job with sketch 99...and thanks for playing with us this week! These are so great. Wonderful job with this challenge! That Flower Soft looks amazing on the trees. Great job on both cards!! Beautiful, Lisa! The Flower Soft looks lovely on those trees. oooooooooh!! These are sooo pretty! I love flower soft! I love your sympathy card! the tress look so real and the colors are great! Thanks for trying the CPS Sketch! Great cards! That Flower Soft is so cool. May just have to get some! Lisa, your cards are wonderful. This was a fun one to play along. those trees are gorgeous! thanks for using the cps sketch! Lisa! this is just stunning! I love the flower soft. Wow!